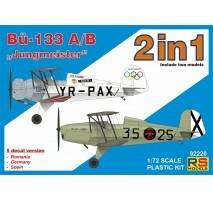 Scale model kit - Bücker 133 A / B "Jungmeister"Scale 1:72Brand/Product code RS Models 92220 This kit has to be built and painted, does not contain paint, brushes, glue or other tools. These must be bought separately. ..